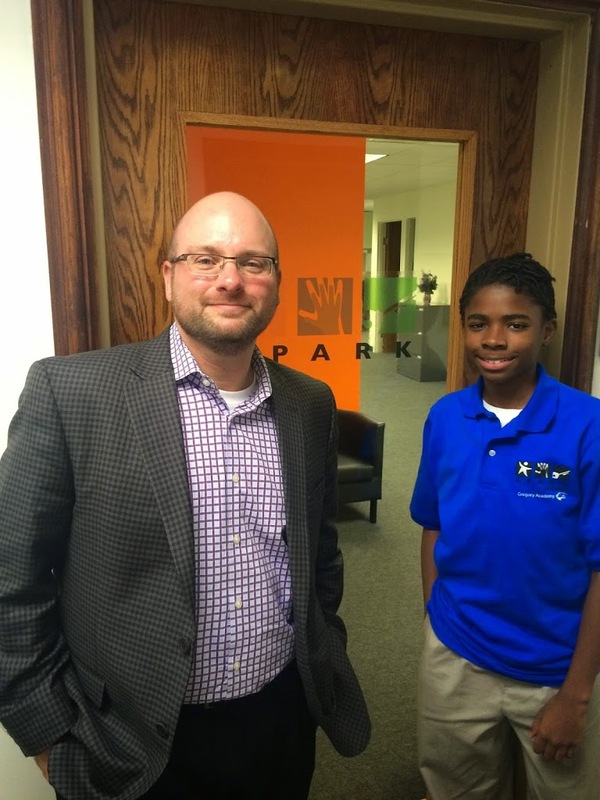 A personal account of Spark CEO Jason Cascarino’s mentorship with Chicago student Isiah. As a Spark Mentor, you’re never quite sure what state of mind your student is going to be in when he or she shows up for the apprenticeship session. Just as we have many distractions as working professionals, young people have similarly dynamic lives. You might catch them on a day when their adrenaline is really flowing and they are super focused. Or you might encounter a student who would really rather be someplace else at the time, for whatever reason. It’s totally understandable and normal. Isiah has always been pretty focused and eager when he shows up at Spark. And this week was really no different. We had our normal chitchat as we walked from the L stop to the office, which in large measure serves as our “opening ritual.” The practice of an opening ritual is an important one. Spark Mentors are encouraged and trained to make room for this exercise at the beginning of each mentorship session as an aid to the student and the mentor to settle in and get focused. Isiah and I spend the time talking about his week, which invariably touches upon tales of him with his friends or siblings. My contribution to the exchange is to talk about my kids and what they’re up to. It’s fun when Isiah picks up on the interests and activities of my boys and articulates how he relates to them. This week I was explaining how my youngest boy, aged three-and-a-half, was in a superhero phase – big time. Isiah took that and riffed for the duration of our walk on various superhero movies and television shows he’s watched and the lesser-known powers of many of them. Did you know that the Green Latern has more than just one green ring? Apparently, there are many colored rings with corresponding powers. I now have a better appreciation for one who often is seen as a bit of a second-tier crusader. This week was the start of building out some content for our web page. We began by sifting through a bunch of pictures in our photo library of Spark mentorships and events. The first section of the webpage is to showcase what students can explore, so we wanted to find some good shots of students and mentors working together. We went back and looked at some of the survey responses to recall what jobs or fields students were interested in and then tried to find pictures to match. This wound up being a somewhat tedious and slow process. I could tell Isiah was checking out. We shifted to writing some of the content, again based on the survey. I said I would take his dictation. We went along in fits and starts. This too turned out to be a bit laboring. I sensed Isiah was tired, or just not that into it, or both. Curiously, out of nowhere, he began talking about pilgrims. He was learning about them in his social studies class earlier that day and started teaching back some of the history. He recounted much of the story: how in England at the time you had to subscribe to one (state-sponsored) religion and that the pilgrims were of a different sect and persecuted and so set sail for America to seek refuge and a new life to practice their faith freely. His telling of the tale was engaging. He went on for several minutes and covered a lot of ground – the trip across the Atlantic, the encounter with Native Americans, the first Thanksgiving and what food and drink were on offer at the time. Some of my Spark colleagues were with me in the office as Isiah carried on and we were all at once entertained and engrossed. I was a history major in college, and I confess Isiah was testing the limits of my knowledge and memory. I did at one point score some good points. Isiah was talking about the class groupings among the travelers by sea, whereby the wealthier folk would have posh accommodations above deck and those less fortunate were quartered below. He was hunting for a word to describe the poorer lot, and said it started with a “c” but that was all he could remember. I blurted out: “commoner.” Isiah was taken aback. “Yeah!” he said with surprise. “How did you know that?” I thought to myself: Dr. Hueston would be proud. This tangent began about halfway into the day’s session, and it lasted the duration. Without really acknowledging it, we paused on our project and just had a nice and very engaging conversation about history. We segued at one point into travel and again touched upon Isiah’s affinity for Thailand. Since our first session, Isiah has been talking about Thailand, wanting to go there and wanting to try the food. I had been meaning to grab some Thai food from a local place and have it ready for him at the office when he came by. So, we took the last few minutes of the session to run through a menu online and pick out some dishes he wanted to try. He was very keen on the fried tofu, having never had tofu and really wanting to try it. We also picked out a spicy noodle dish, some satay, and a curry. We’ll have our own little ethnic Thanksgiving feast next week. It’s hard to pivot like this. In my work I tend to get very focused on a project or a task and be nose down and bang it out, avoiding distraction as best I can. So, being adaptive, picking up on Isiah’s cues, gauging where his head is, and just going with the flow are good lessons when working with a thirteen-year-old. Indeed, I guess we all could use a breather from the seeming intensity of our work and deliverables. We could all stand to pause every now and again to share our favorite studies of history, places we’re most curious to visit, or food we’ve never tried but want to. It’s times like this when roles seem reversed. I am the learner and Isiah is the one modeling, subtly or not, a new or better way to operate.